This 2-day tour to Acadia National Park and Bar Harbor, Maine is a great overnight getaway from Boston! 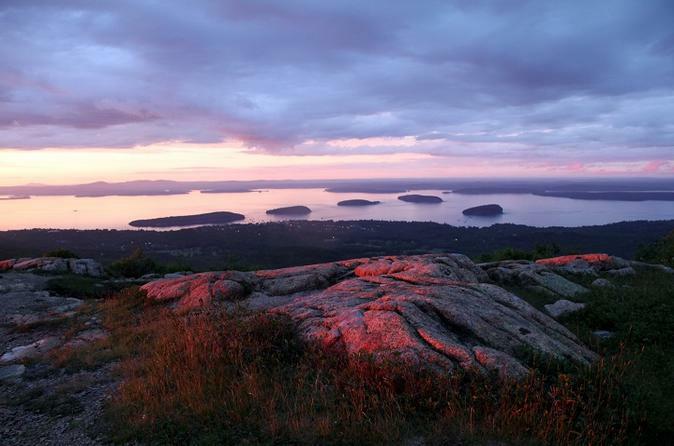 Enjoy roundtrip transportation, spectacular views in the National Park, and fresh lobster and blueberries in Bar Harbor. A quick stop at the Portland Head Light on your return to Boston caps off a fun, relaxing trip through New England! Your tour will depart from Boston in the early morning as you begin your drive up to Acadia National Park in Maine (entrance fee not included). The park is considered the smallest National Park in the US, but features stunning views in all seasons! Your first stop inside is beautiful Sand Beach, tucked away between two walls of solid pink granite. To the south, the beach is open to the sea with spectacular views ideal for pictures. Continuing your tour you'll drive up to Cadillac Mountain and stop at Thunder Hole, where you may have the chance to experience its thunderous sound. Atop the pink granite Cadillac Mountain, you'll be able to take in the sweeping views of the Atlantic Ocean and the Frenchman Bay. Cadillac Mountain is the highest point along the North Atlantic seaboard and one of the first places in the United States to see the sunrise. Your next stop will be Jordan Pond, which is recognized by the distinctive shape of the two mountains- the “Bubbles”. The water in the pond is extremely clear and, when it's calm, you can see the rocks on the bottom of the pond and enjoy the mirrored reflection of the “Bubbles”. Your first day ends after Jordan Pond with a relaxing stay in your local hotel accommodation. The next morning, you'll depart from your hotel for Bar Harbor. There, you have the option to take a cruise (ticket fee not included) to learn about the local wildlife like harbor seals, bald eagles, and sea ducks. During the cruise, your captain and staff will speak about Maine lobster and the long tradition of lobstering in the area. At lunchtime, you are free to seek your own lunch and enjoy steamed Maine lobster, lobster ice cream, blueberry ice cream, blueberry pie or even some blueberry beer- classic staples of Maine! After enjoying lunch in Bar Harbor, your group will begin the drive back to Boston. On the way, you'll make a stop in Portland Head Light. Here, you can partake in an optional visit to the historic lighthouse located in Cape Elizabeth, Maine. First lit in 1791, making it the oldest lighthouse in the state. Portions of the building, which is located in Fort Williams Park, serve as a maritime museum. (admission fee not included) . Afterwards, the tour will complete its final leg and return your group to Boston.